Could your body language be more expressive? Do you inhibit your natural body language when you’re public speaking because of your self-consciousness? Or maybe you’ve been told (by a well-meaning but misguided person) that you wave your arms around too much? As a result you’ve shut down your natural gestures and become stiff and boring. The secret to curing boring body language in public speaking is to replicate the state you’re in when you’re in an animated one-on-one conversation. When you’re in that state your gestures unconsciously complement what you’re saying and give your message energy and persuasive power. You’ll look and feel more confident. And there’s even evidence that natural gesturing makes you more fluent. Put down anything you’re holding, whether it be a pen, the remote or your notes (once you’re gesturing naturally you can hold your notes or the remote, but for the moment they just make the task of freeing up your gestures more difficult). Holding your hands together, putting them in your pockets, or hanging onto the lectern will stop you gesturing. So where should you put your hands? For the moment just let them hang loosely at your sides (this is a default position – this is not where your hands will stay). I know that this feels awkward. You probably feel a bit like a gorilla! 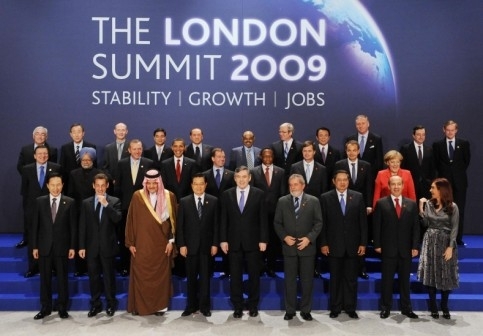 But have a look at the photo to the right… do most of these global leaders look like gorillas? No. The only one who looks awkward is the one who doesn’t have his arms hanging loosely at his sides! Your hands will probably creep together without you noticing. When that happens, immediately separate them again. OK. We’ve got rid of the barriers to expressive body language. Now what? When you’re in a one-on-one animated conversation, your hands naturally gesture. So kick-start your hands into gesturing by replicating that animated state. Do this by looking at one person and feeling in that moment that you’re just talking to them – and to no-one else. At the end of a phrase or short sentence, talk to someone else in the audience. But always be talking to someone (for more tips like this see: 8 presentation tips to make your eye contact more powerful). To enlarge your body language, move your feet. You could for example, move towards the person you’re talking to. The larger body movement will free up your body and will encourage you to make larger gestures. For more ideas on moving while you’re public speaking click here: 9 ways to use space in your presentation. Once you’ve opened up your body language, check that you’re not making repetitive gestures. Either ask someone to give you feedback, or video yourself. In my early public speaking days, I watched back a video and saw that my most common gesture was moving my right arm from the elbow outwards – like I was constantly opening and closing a door. Once I was aware of it, I caught myself doing it and was able to change what I was doing. Remove distracting and repetitive gestures but don’t try and choreograph what you’re saying with specific gestures. It will look forced and unnatural. Follow these five steps and you’ll develop natural body language that will add energy, engagement and persuasive power to your presentations. You mean that when I hold my remote cleverly between by thumb and forefinger, and make some lame pointy action with my remaining fingers it looks weird?!! Thanks for confirming what I thought, Olivia. I’m going back to square one and carefully following your helpful suggestions. Thanks for bringing that up Jonathan. I didn’t cover in the post how to hold the remote once you’ve freed up your gestures. The secret is to hold the remote as if it was just part of your hand. Place your thumb on the button which advances the slides and keep it there, so that you don’t have to look every time. Then gesture as if the remote wasn’t there. Most remotes these days use radio waves to communicate with your laptop, as opposed to infrared – this means that you don’t have to point the remote at the laptop. Some people who are used to infrared remotes hold the remote like it was a fishing rod – even though they’re now using a radio remote. BTW if you’re still using an infrared remote, go out and buy yourself a radio remote. Since our non-vebal elements of our presentations trump everything else, these ideas are worth studying. Thanks Fred, though I don’t agree that non-verbal elements of a presentation trump everything else. I believe that body language is important in the sense that it can either sabotage or enhance the delivery of the content of the presentation. You are right that there is too much emphasis placed on body language. If the content of the presentation is strong enough, only very strong or irritating gestures can upset the flow. I’m with you on the idea of natural, conversational style. I think the advice of looking at one friendly person is very useful too. In the era of headsets and lapel mikes, I’m astounded at how many times I have to wield the giant, phallic microphone. Isn’t it time those bad boys went away for good? It does rather get in the way of having a natural, relaxed conversational style doesn’t it! A solution is to invest in your own lapel mike, transmitter and receiver, and then you’re not reliant on what the venue can provide. It’s interesting that we tend to see things like mikes as something the venue or AV guys provide – rather than our own personal equipment. But it’s small and not that expensive, so if you’re a frequent speaker to large audiences it makes sense to have your own. I love the ideas and can’t wait to see Olivia put them into action at the Presentation Summit this fall in Austin TX. I would like to challenge one of them: move your feet. That one warrants further discussion — in my experience, people who move their lower bodies do it at the expense of upper-body movement, i.e. gestures. I also encounter people who drive audiences nuts with too much striding back and forth. I have found that the most natural gesturers are those who have learned to quiet their lower body. That doesn’t mean that they become a tree — I do advise that presenters work the room. But I normally tell them to walk to a place and once they get there, to once again become quiet from the waist down. Everything warrants further discussion, and I’m looking forward to having some of those discussions with you at the Presentation Summit! And every piece of advice about presenting and public speaking can be taken too far. There can be too much of anything. My advice “Move your feet” in this particular post is particularly aimed at people who are stiff and frozen in front of an audience. I’ve found with some people that the best way of encouraging them to start to gesture, is to get them to walk – it’s like it unblocks something inside of them, and suddenly they start gesturing too (without even realizing that they’re gesturing). Looking forward to those after hours discussions. Too many public speakers do that is planted behind the microphone. The body language is sometimes more useful than punctuation. “You probably feel a bit like a gorilla!” What a wonderful comparison. My customers in Germany also said “I fell stiff like a statue”, in German “stocksteif”. Thanks for the 5-step cure, you really come straight to the point! I find it useful to acknowledge that people don’t always feel comfortable trying out suggestions. Even though we’re aiming for “natural”, it doesn’t mean that it will necessarily feel natural to begin with. ha this is always an issue for me…great article! For feedback regarding body language and other items of your speeches, try Toastmasters – http://cooltown.toastmastersclubs.org/ . Local clubs worldwide.